Architecture, the individual rooms, uniqueness. Being away from the crowds. Loved the outside bar and ambience. The kind staff and very nice food. Oh and loved the complimentary bar of chocolate left in the room - great for the teenage daughter! 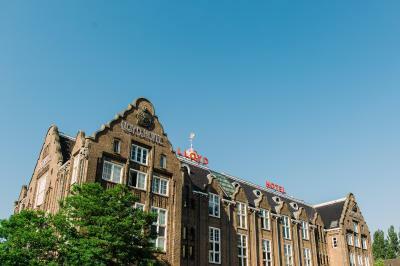 The Lloyd Hotel is a good place to stay while in Amsterdam. Note that it is a distance (3 tram stops ) from the train station and downtown. About a half an hour brisk walk to central Amsterdam. This was ideal for us as we were catching a boat from the nearby dock and we prefer quiet neighborhoods. The rooms were large by european standards, bathrooms big, water pressure good, and everything clean. There is an elevator. Staff were very helpful. Tip: there is an excellent Spanish restaurant right across the street where you can get tapas and sangria. Best meal we had in Amsterdam. I already did this. The staff were really friendly, especially the night porter. The restaurant it a beautiful and unique place, like the whole building. It was unusual to share a bathroom but understandable from the institutional past of the building. Staff ok, environment directly by the sea perfect. I very like the design of the hotel. Also very good location. Just 5mins walk from the tram station. This station is just about 10mins to centraal of Ams. Opposite of the hotel is the Jumbo Supermarket that is so convenient. Highly recommend!! This hotel is not far from the Central Station (about 10 min by tram) which makes it a quite good location. The building itself is fantastic, tastefully renovated with a modern touch that doesn’t ruin its historical atmosphere. Across the street you’ll find a supermarket,a small shopping center and couple of places to eat. The staff was very friendly and helpful. The restaurant on the first floor was great. Large portions and a decent selection of drinks. Good location for my business trip. Spacious room and very good breakfast to a fair price. Good comfy restaurants nearby and shops where one could buy some snacks etc. We didn't eat hotel. we had few drinks sat outside in beer garden, which was nice and relaxed and service was good. Location was great and easy to get to the tram. bed like cloud preferred. I also preferred extra fluffy eggs. The scene from the room is excellent. Lloyd Hotel This rating is a reflection of how the property compares to the industry standard when it comes to price, facilities and services available. It's based on a self-evaluation by the property. Use this rating to help choose your stay! Lloyd Hotel offers unique rooms in a transformed historic building, within 10 minutes you will reach Amsterdam Central Station by tram. Bimhuis concert hall is a 15-minute walk away and the Lloyd Hotel is 2,950 feet from Pakhuis de Zwijger. Guests benefit from a terrace, an excellent restaurant and free WiFi. The Rietlandpark tram stop is 650 feet away and offers services to Amsterdam Central Station within 10 minutes. Anne Frank House and Dam are both within a 10-minute walk from there. Leidseplein and the Jordaan district can be reached by taking tram 10. Muziekgebouw aan 't IJ is 0.9 miles away. The iconic building of the Lloyd Hotel has spacious rooms in all shapes and sizes, every room is unique. Guests who wish to explore Amsterdam in an active way can rent a bicycle at the hotel and request a packed lunch for their trip. These rooms with views of the water have been decorated by the Amsterdam based designer Christoph Seyferth. Please note that these rooms have a shared bathroom in the hallway. These large rooms with an private bathroom are styled by Dutch designers. Please note that the bed preference is not guaranteed and subject to availability. Please note that when a third person sleeps in this room an extra single bed on wheels will be added to the room. Featuring the historical character of the monumental building, this room benefits from a spacious layout. Featuring a Dutch characteristic decor, this spacious suite comes with unique elements ranging from a concert piano to an XL bed. Please note that all the suites are different. Yet, they all feature a Dutch characteristic decor with unique elements. If guests require a specific room, they can request this through the Special Requests box or by contacting the accommodations prior to arrival. This light and modern room benefits from a spacious layout. Most of these rooms have an open bathroom. Hotel surroundings – This neighborhood is a great choice for travelers interested in city walks, atmosphere and sightseeing – Check location Great location - show map Guests loved walking around the neighborhood! House Rules Lloyd Hotel takes special requests – add in the next step! ATM card Lloyd Hotel accepts these cards and reserves the right to temporarily hold an amount prior to arrival. Lloyd Hotel accepts these cards and reserves the right to temporarily hold an amount prior to arrival. Not really anything, perhaps a hook for hand towel if being really picky ! Location was perfect. Away from the frantic of the city, quiet location, but easy access to trams to get to all tourist attractions easily. I think frontline staff need a little more training. We had a number of confusions when checking in (one computer was down) and also when ordering breakfast. Neither were the end of the world but checking in time should be made as smooth as possible when you've travelled a long way and are tired. Breakfast - we were sometimes asked twice to give our room number. The system was a little confused to say the least. Fix these and the place is all good! This is my only issue. I would still recommend The Lloyd. The history display is a must- give yourself 15 mins at least to follow this. The Lloyd has an extraordinary past - read it and it will really add another level to your stay. The food was excellent throughout- the breakfast is well worth 17euros so get up early and hungry! Coffee great. A wide and great quality selection of jams, juices, smoked salmon, granola and smoked bacon. Everyone is catered for. We also dined once and we were all very impressed. Delicious! Stylish surroundings too. Beds very comfy. Shower strong and hot. Lovely bathroom accessories- gel and body lotion. Spotlessly clean. Easy transport - 3 tram stops to Centraal Station - only 7 mins or so. Not clean .Bugs in the basement rooms. Breakfast was not included in our price, but we splurged and paid the 15 euros each one day. Not worth the money. Waitress ignored us. Food was in warmers. Many of the items were missing and those that were there were not freshly made. Coffee was by machine, and machines do not make decent latte's! Vibes were weird. A little creepy if you like that sense but overall very strange. I upgraded my stay and regret that I did. Very cool hotel with funny rooms because it has been a prison earlier. Like it very much! The bathroom windows weren't completely sealed and there was draft coming in through the windows which made showering paunful because it was so cold. The room didn't have a toilet which was unusual. For the cost, I think it would have been appropriate. It was a pity because everything else was good. It wasn't clear that bathroom wasn't included. Location was good, very good. The building's history was very interesting and its design. Very clean rooms, and sheets were clean, well prepared beds. Gorgeous view. I found it bothering that the socket plugs were old fashioned (not accessable for every adapter) and there were simply not enough/ not well placed to use. All the lamps and tv were connected so no free sockets for chargers. The sloped roof takes away a lot of space. Basically the room is just too expensive for what you get. The bed was nice and cosy. The pillows are great. The room as such was nice, it had been painted recently and the interior was new. The breakfast buffet is also very good. And the dining hall is amazing.